Can you tell our audience little bit about yourself and your hockey background? I grew up in Southern California, the son of a Thai father and Colombian mother. I was 8 years old when Wayne Gretzky became an LA King and once I saw the games on TV I knew I wanted to give the sport a shot. I started playing at Paramount Iceland which is actually down the street from where Zamboni is headquartered (fun fact). It seems as I lived on the ice from there on out playing pee wee through my College years. 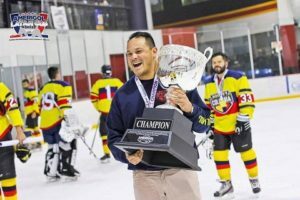 How does the Coach of Chapman University hockey team end up coaching the Colombia national ice hockey team? I believe I have the best coaching jobs in all of hockey. I get to coach my alma mater and the national team that is culturally so close to me. I saw that there was a Colombian national team that had participated in the first Pan-American hockey tournament in Mexico City in 2014. I sent the team an email offering to help in any way possible. A few months back went by without a response and then one day I got a call that the Head Coach position was open and it all goes from there. You have had success with Colombia winning the Pan American tournament twice and now the Latam Cup. What do you tribute your success to? I give our players all the credit for the success I have had with this team. I have been fortunate to work with a group of players who have won as a group playing roller hockey or individually at the College or Junior level on the ice. When I took on the role of Head Coach I came in with a clear direction and systems that I wanted to implement offensively, defensively and the player bought in and executed shift in, shift out. I’m proud of our players for taking this approach and it’s the main reason for our success. Colombia is a very new to the game of ice hockey how would you judge the talent on the team? Our group is made up of Colombian players based in the US, Sweden and Colombia. Our players from Colombia have to be some of the most talented I have seen throughout my coaching career. This is a big statement since there is no regulation size hockey rinks in the entire country. The skill development through roller hockey is very evident. About a third of our team is based in the US and this has really helped bring our team along. It’s an advantage to have players out of the ACHA and ECHL. 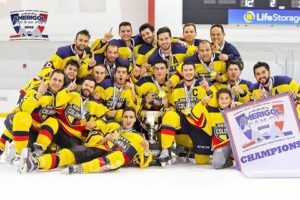 What are the challenges for the advancement of ice hockey in Colombia? I would say the biggest challenge is developing the ice hockey infrastructure. As I mentioned before, there are no ice rinks in the country. The same could be said for the other countries we compete against. 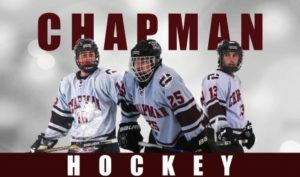 Chapman University Hockey team is not having a great season, do you think you can turn the season around? The Chapman program is currently in a rebuilding phase. I would expect better results by the end of the season and beyond. You are also a Golf nut and the founder and CEO of Cut Golf can you tell us little bit about this adventure? I love golf as much as I love hockey. About two years ago decided that having to pay $35-50 for a tour quality golf ball was insane. Started doing some research and was able to find a way to launch Cut Golf where we offer a tour quality golf ball for under $20 ($19.95 to be exact). It’s absolute blast and I lead our organization more like the captain of a hockey team versus your typical CEO. who are some of your favorite Ice hockey or inline players? I’m very old school. I grew up idolizing Wayne Gretzky. Brendan Shanahan, Luc Robitaille, Eric Lindros and Steve Yzerman were some of my favorite players growing up. They just don’t make them like that anymore.